Cengage Advantage Books: Cultural Anthropology 6 Edition Learn anthropology within a strong active learning environment when you open Robbins' unique sixth edition. In a first of-of-its-kind problem-based format, this brief, cost-effective text presents a variety of questions focused on the most important issues anthropologists study. You'll find yourself thinking critically about today's world as you read engaging Chapter Openers, complete integrated exercises, and review unique Case Studies in Doing Anthropology at the end of each chapter, now with new locator maps for your convenience. 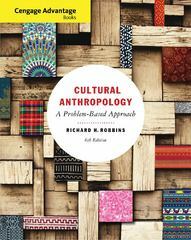 In a unique problem-based format, Robbins' text presents a variety of questions focused on the most important issues anthropologists study. Within the book's engaging narrative, you'll learn how to analyze your own culture as a basis for understanding the cultures of others. Presentations are organized around problems rather than topics, creating a natural discussion of traditional concerns such as kinship, caste, gender roles, and religion. Meaningful questions integrated throughout further guide you in exploring these subjects.